Even though NPR only recently discovered that people are willing to pay more for artisinal food, I think most of the rest of us are aware of this trend. As much as we all want to eat the most local and most healthy food I think the biggest draw for this kind of cooking is generally this artisinal style food is often a simple, simple food elevated to it’s highest. 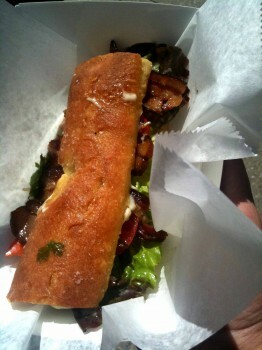 I finally got a BLT from the Cruze farm truck the farmer’s market. I’ve been meaning to all summer, so on this that was the last weekend of the summer I finally had one. After eating one of these, I would have paid twice the price and in someways it’s good for the ol’ waist line I didn’t know how good this sandwich was given the number of Saturday’s I’m at the market. It was amazing. Benton’s bacon, an incredible bread that was part baguette part brioche with a salted outside, lettuce and tomato and delicious mayonnaise. It got me re-thinking about how lucky we are here in Knoxville to have the number of amazing producers of products that we have. So, this weekend do yourself a favor, if you haven’t already as I’m a bit late to this, and go to the Market Square Farmer’s Market and get a BLT for $4. Be sure to get mayo on it. Friday, September 10th, 2010 at 7:18 AM	| Filed under Uncategorized	| Follow responses Both comments and pings are closed.